I’m sure you have seen many of our Publix Aprons recipe cards while in our stores. Have you ever stopped and thought to yourself, “There is no way I can make that!”— I have. I remember seeing our Aprons Cooking School and becoming curious as to what exactly these classes were. Would these classes teach me things in such a way that it would be easier for me to become the chef I want to be? Will I be able to keep up with what the chefs are talking about? Would I walk away from the classes with new skills I can apply in my own kitchen? Well, the answer to all of these questions is yes! 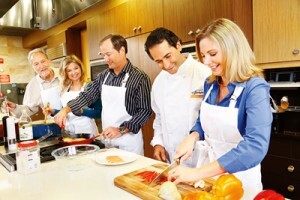 Now in order for me to tell you all about our cooking school, I had to go experience it myself. I had heard that the Aprons classes entertain, amuse, and inspire people to become better chefs. Well, I can tell you I felt just that! Walking into my first class, I wasn’t sure what to expect. However, all three chefs teaching that evening immediately greeted me. The conversation was so easygoing as more people began arriving, it almost felt as though we were all in a friend’s kitchen just hanging out. Exchanging jokes and laughing with new acquaintances, I immediately knew I was going to enjoy the evening. My first class was a demonstration. The atmosphere was that of being in the audience of a cooking show, except you get to ask questions, see up close and personal, and build a relationship with the chefs. After looking at the menu for the night, I was a little nervous about whether I would grasp the concept of how to poach scallops or what blanching them meant, but everything was explained with such detail and simplicity, I was confident I could do it all at home, too. During the class each course demonstrated and presented by our Chefs was thoughtfully paired with a wine or beer. The hands-on class was an entirely different experience. The chefs are right there with you while you and the other students use your hands to help prepare the meal. You and your classmates surround a large kitchen island with all the ingredients and tools for the session. It was fun being involved and trying dishes I have never made before. 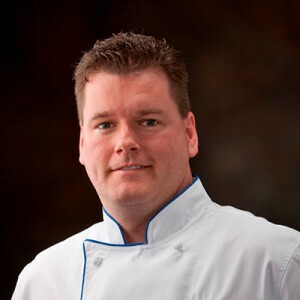 The best part was that the chefs are there to give you expert direction and help with anything you may be unsure of. I had never used a lemon zester before, but the chef instructed me in the safe and proper way to hold the tool while zesting the lemon. Little tips and tricks for kitchen gadgets or recipes will really help you on your way to becoming a better chef. When the cooking is done all the students will enjoy a family style meal served with wine or beer selected by our Chefs to complement the meal. Get ready to eat during these classes. Whether you take a hands-on or a demonstration class, you get to eat everything that is made. What better way to expand your palate than by trying new foods and satisfying your belly! It’s also good to know what the dish will look like when completed, and see it all the way to the delicious end. There is Always a Plus! There are so many added bonuses to taking these classes. You are not the one doing the shopping for the ingredients, they are there ready at your fingertips. The old rule of “I cook, you clean” does not apply. In other words, you won’t have to clean up the mess you make! These classes also make for a great date night. Impress your date by showing them that you can cook. Classes are also an opportunity to meet new people. What a great way to get out in your community and make friends! Also, our customers who attend a class get a 20% discount on purchases made the day of the class on our Apron’s houseware items (available only at cooking school locations). You also get to eat — a lot — while learning the proper methods and the chefs kept me entertained the whole time. Kids, Junior & Teens hands on classes are also offered throughout the calendar year. Plus, it’s fun! How do you know which class is for you? Ask yourself what it is you want to get out of the class. Do you have a hard time figuring out how to use a can opener and lack technique? Or perhaps you’re someone who wants to expand their knowledge of exotic cuisines? 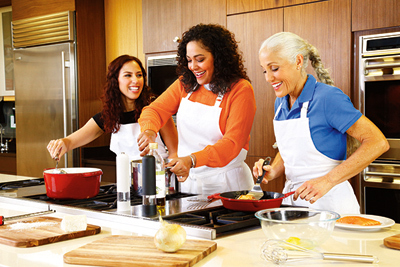 Our Aprons Cooking Schools offer a wide variety of classes sure to pique anyone’s interests. Many customers are intimidated by cooking and there are so many new and interesting ingredients and techniques we can share. Making a meal shouldn’t be a chore and we hope to help customers in a fun and exciting way. Come join us in one of our classes, we would love to have you!